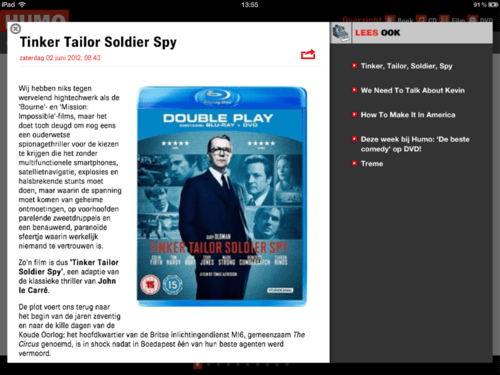 An extreme case of bad UX in a magazine app: Review of HUMO's iPad app - Harold Tor. 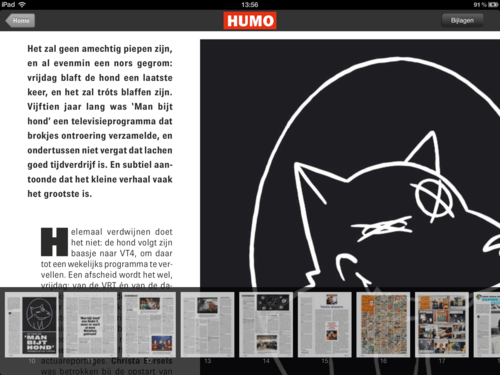 Today, let’s look at the iPad app of a Dutch-language entertainment magazine dash TV guide in Belgium called HUMO. The UI of this app is a classic example of how print people are trying to cope with the loss of revenue through the lower sales of printed publications and the rise of portable web-linked devices like the iPad or smart phones. It is also a classic example of how these people reign over the development of the iPad app rather than work side by side (aka on equal standing) with UX experts in iPad developments. I hope I sound subtle enough in my criticism. The app first opens with cubes of sections on the right. On the left, you have the option to download and browse the latest issues of the magazine. What strikes the user is the blurred font of the article, which for some reason cannot be enlarged when double-clicked, unlike say a web article read on Safari. Apart from being blurred, one immediately recognises the same font used in the magazine. But this font reads uneasily on a mobile device. On the top is the Share button for sharing on Facebook and Twitter. OK. I am reading the issue in pdf. As with all pdfs, I can zoom in and out, a feature which I miss in the article section featured just now. But as it is pdf, it is pages out of the magazine which is not in the same UI as the feature section. Why? Furthermore, the user cannot share an article and thus restricts the dissemination of a good article should it be so. Behavour-wise, users of mobile devices are not readers of your magazine per se. Instead of viewing your app as an iPad version of your magazine, you should examine your user’s needs and behaviour. Make it easy for them to do what they want to do, not harder. When talking to print people, they often use the excuse of having to justify the profitability of their iPad venture. There are various money-making models which you could consider for apps and these may not be your traditional way of revenue (through sales and ads). It is a new world, so you should be as creative in this area as you like. Most importantly, you should not do so at the expense of the needs of your users. More people will use tablets to browse their magazine, not less, so there is no benefit for you to sideline the needs of your mobile users. No wonder this app has received only a single star in the app store.